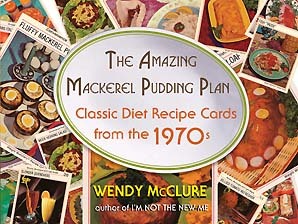 The notorious 1974 diet recipe cards, originally posted on Candyboots.com, in full-color, full-frontal glory! Over 100 recipe cards with commentary. They were neatly arranged in their own plastic file box. Plenty of the dishes seemed normal enough, but as I flipped through them, some of the recipes began to alarm me. And then I found the card for the Rosy Perfection Salad. I fell over. I laughed so hard I started coughing, and I fell back on the floor and I waved the card at my mom, who just rolled her eyes. ‘Can I please have these? Please?‘ I begged. ‘What do you want them for?’ she asked. ‘To cook?’ ‘No,’ I said. She let me have them. I think they might have been my grandma’s, but she never copped to actually buying them. Nobody else did, either. 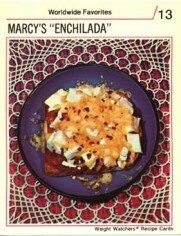 The original Weight Watcher Recipe Card collection was a viral sensation in its time!